This may sound a bit crazy, but I've literally been collecting vintage chandeliers for several years. I've just been waiting until our family finally landed after moving twice in the past year! I literally have been lugging these things across the country, so I finally spent a couple of hours on Sunday scrubbing and re-habbing my favorite glass chandelier. This was a very dirty chandelier, but after taking every strand of crystals off and washing them in mild dish soap and rinsing them in a mixture of warm water and windex, I finally got it shining to it's former glory again. My husband and I hung it up afterwards and all that washing was worth it! Much better than that old fixture, huh? ﻿Two chandeliers down...many more to go! I LOVE, LOVE, LOVE your vintage chandy! It shines as if it is brand new! I am so impressed. Five years ago when we built our house, you couldn't have given me chandies, now I am dying to replace my fixtures, but they are so costly! Great job you did! Its beautiful... good for you getting what you wanted. Your home is beautiful, and you've given it some wonderful vintage touches. Love the chandies. I LOVE your new chandy from Ballards!! Your home is beautiful!! Your home is beautiful & I love love ur chandeliers!!! LOVE both chandeliers - but I think the crystal one is my fave. I know I've said it before, but I just love your blog and look forward to your new posts! Your home is gorgeous! I love and adore them both!! Two absolutely gorgeous chandeliers! They add such beauty and character to the rooms! I love the twiggy one too, it's just beautiful and I've been eyeing up one just like it. All I need is a cheap electrician to run the wiring for me, ha! Thanks for your nice comment on my blog. Take care and have a very Merry Christmas! All I can say is you are fabulous and I will leave it at that! I am adding you my google reader so I won't miss anything! P.S. We are going to be featuring your DIY wrapping paper tomorrow at Inspiration Friday so be sure to stop by! Your decor is so lovely and your choice in chandy's is exciting to see. I love them too. Great job and so pretty. Hey there Kristen! I am so glad you clicked on the FOLLOW button on my blog so that I could find YOU!! I featured you this week on my blog...I hope that is ok! I love all that you are doing and your decorations are so beautiful. Merry Christmas. I hope you have a very blessed week! Gorgeous vintage chandy Kristen, you did a great job leaving her looking sparkly! I have a daughter who's name is Sophia, came to visit you because I saw the name and you have a terrific blog, so I have become your newest follower, this way we'll get to know each other better. 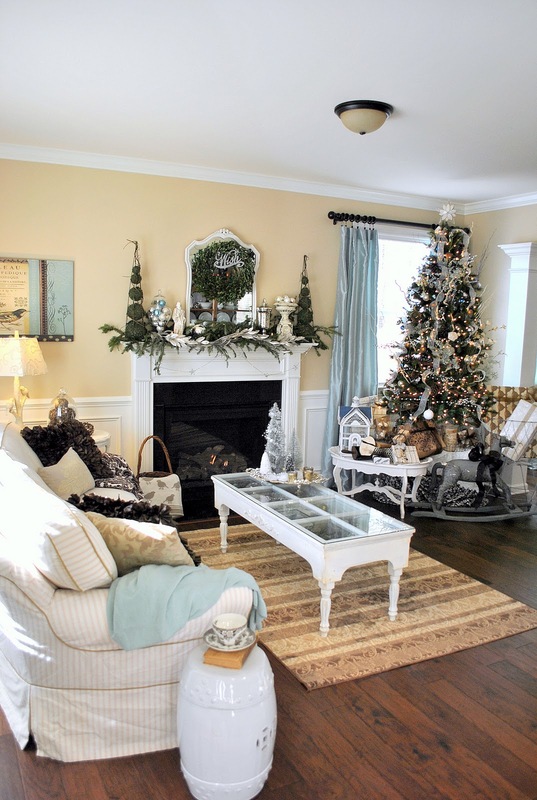 I love your gorgeous tree and your home is looking fabulous for the Holidays. Hope you visit my post. Merry Christmas! I'm loving the additon of all your chandeliers! Funny you are putting them up and I am taking them down. I've had chandeliers for so many years now (14 in all) and I've grown tired of them. Not sure what I'm putting in their place (right now just a bulb hanging) but I will figure it out! Have a Merry Christmas, maybe Santa will bring you another chandelier. This was well worth the hard work - your chandelier glistens! Your home is beautiful- I can't wait to explore your blog further. I'm a new follower! Looks so pretty--I love your tree too! That is the most beautiful chandelier! 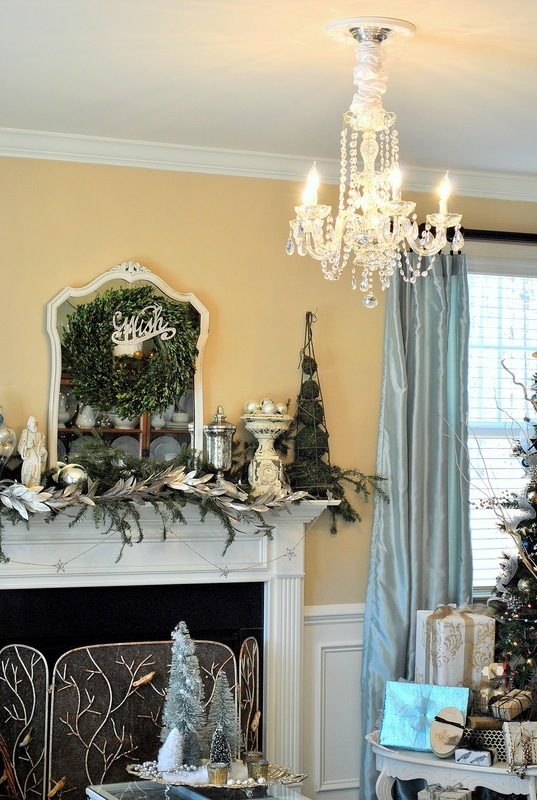 The mantel is lovely too! I absolutely love your tree and that chandelier is stunning. I am trying to switch out builder grade light fixtures as well, slowly but surely! I am a new follower, love your blog. 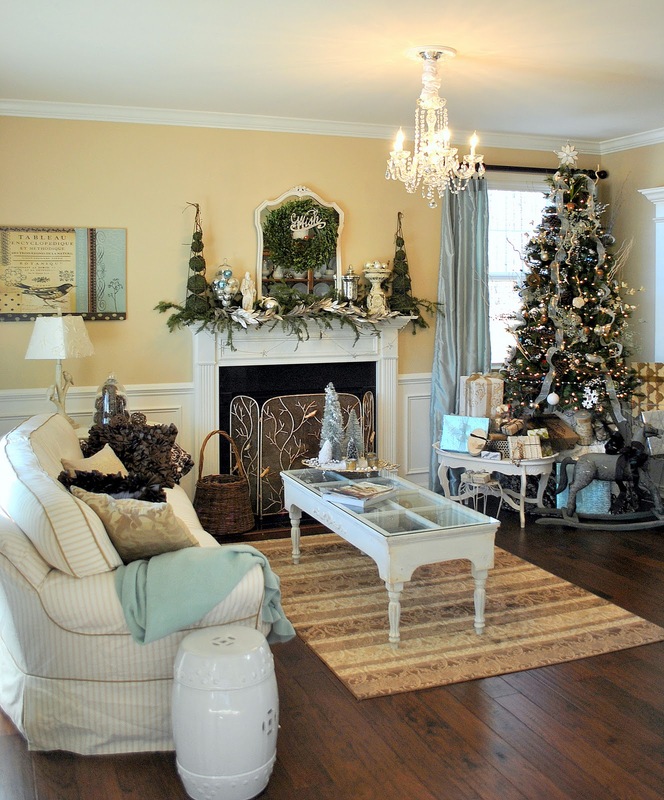 Hi Kristen, Your home is GORGEOUS and so beautifully decorated for Christmas. Your chandys are fabulous and I don't think it is strange at all to collect them. I have two in my attic now waiting for our next house. Thanks for linking to the Open House party and Happy Holidays! It looks beautiful Kristen..I adore it. I bet that was a job cleaning all those crystals. Headed to the flea market tomorrow with kids and hubby in tow. Figured it would be something different to do on Christmas Eve. Merry Christmas to you and your family. Your chandy is gorgeous! Thanks for linking it to HSH. This is my first time visiting your blog. IT IS FABULOUS!! So love the new chandy and those blue, it it dupioni silk drapes? BEAUTIFUL!! I love your vintage chandy! This is an amazing transformation! Your blog is lovely, as is your home! I'm coming over from Debra's Common Ground. I'm a new follower! I love your blog! I think your chandelier is almost the same as mine. You are so right about being a pain to wash. I've been poking through you archives- there are so many gorgeous posts. I love your "new" home and how you've decorated it! I was wondering where you got your dining room table from? The one under your new chandy?